Vacation rental house. 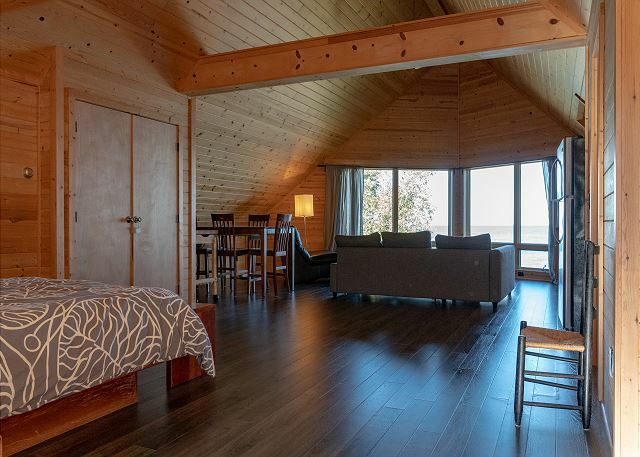 Sleeps 17, 5 bedrooms, 5 bathrooms. No pets allowed. 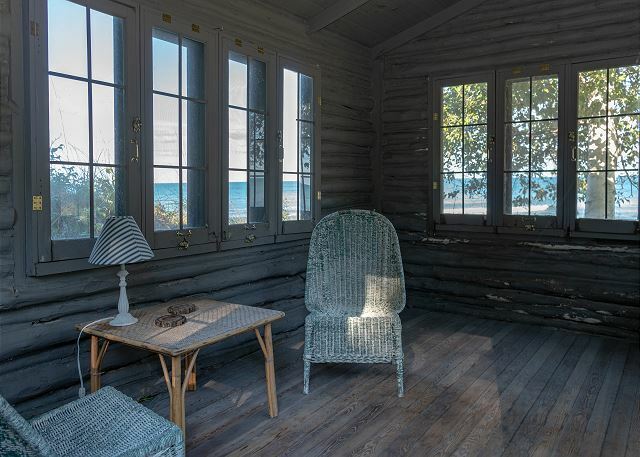 You will love the privacy of Bellavita. 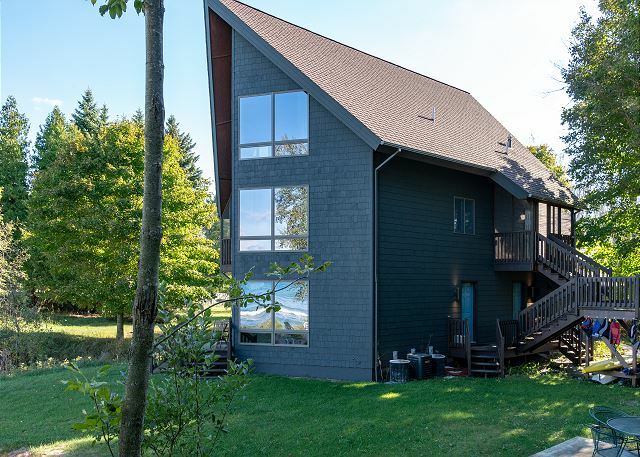 Three floors of private living makes this the perfect place for a multi-family vacation home. 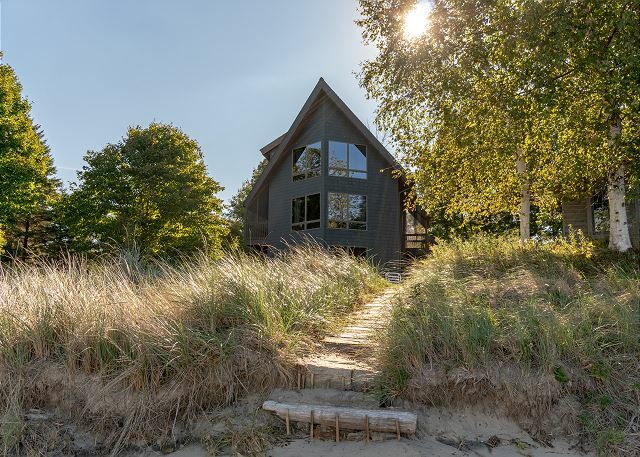 This will become the vacation home your family will want to come back to year after year. 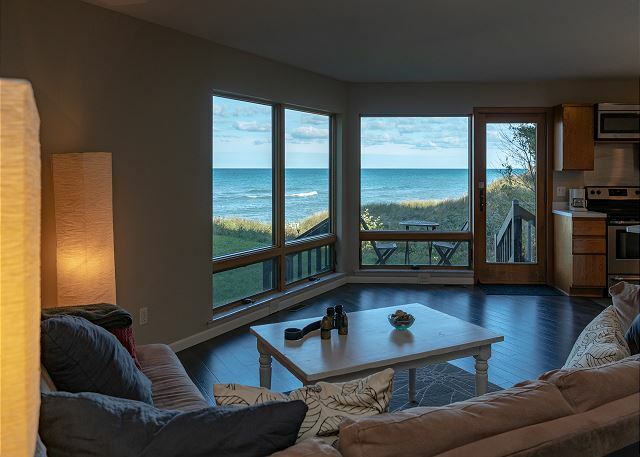 Enjoy beautiful views of Lake Michigan from inside the home. The main floor has plenty of room to accommodate a large group. With dining seating for 10 between the two adjacent tables and an additional 5 spots at the kitchen counter-top bar you will be able to host a large family dinner. 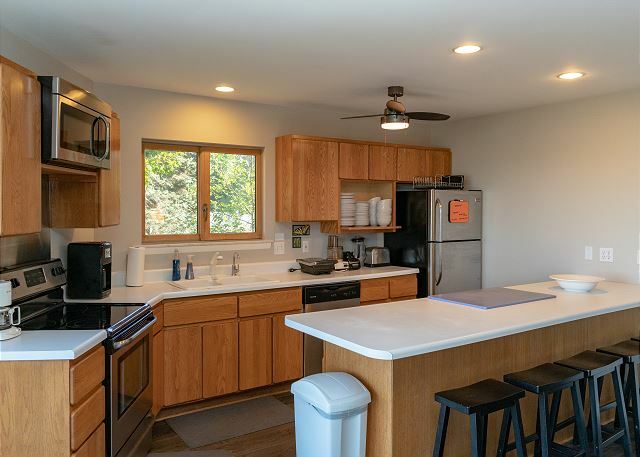 The main floor kitchen is fully stocked with everything you could imagine including a waffle maker, blender, toaster and food processor. You will find plenty of dishware, utensils and cookware. 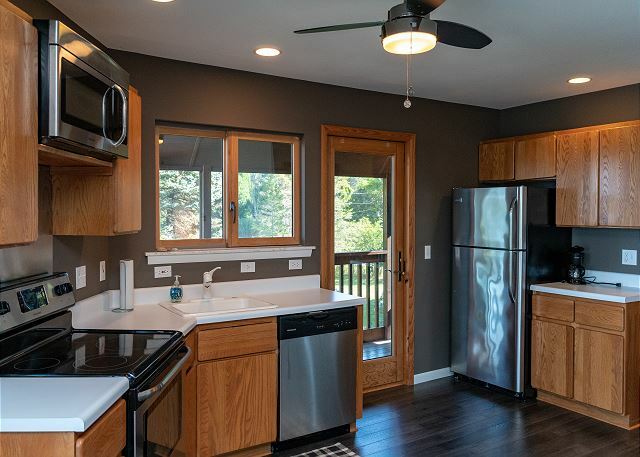 Plenty of space to prepare delicious meals right from your vacation home. This main floor shared sitting room is the perfect place to hangout on a rainy day, watch movies, read a book or play a game. 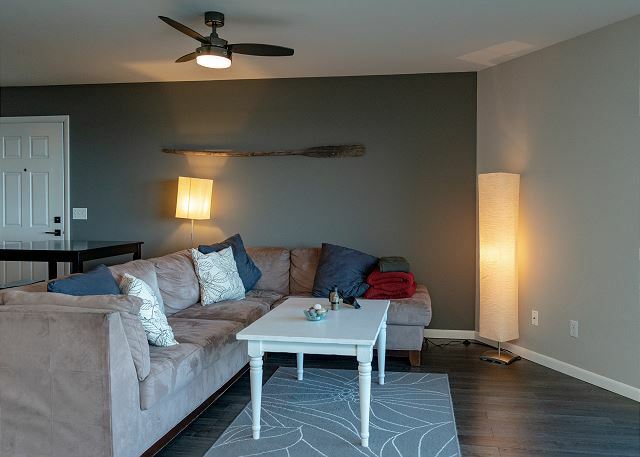 This sitting room is centrally located on the main floor, making it a great place for your entire party to meet and watch television. 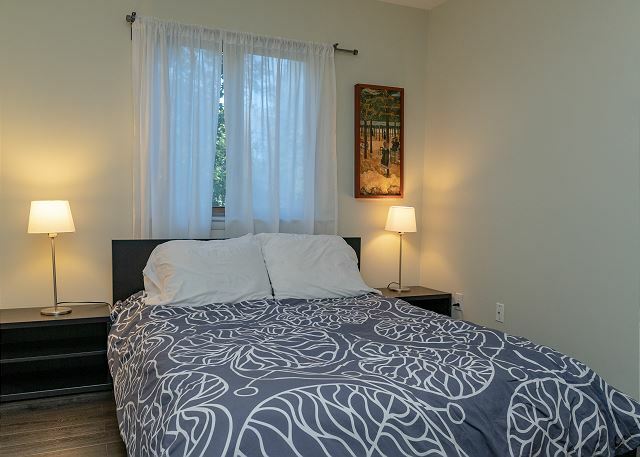 This bedroom is located on the main floor and has a Queen and Full size bed. Main Floor bedroom #2 with full bath directly across the hall with separate toilet room. 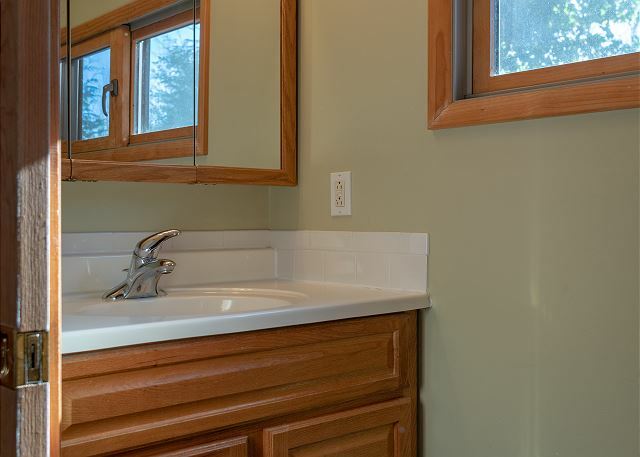 This bath is located adjacent to the second bedroom on the main floor and has a separate toilet room and full shower stall. 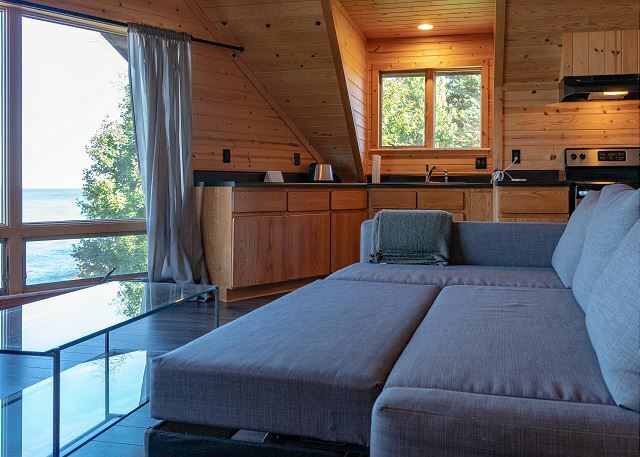 The kids will love their very own loft area, located off the main floor level and featuring both a Double and Twin bed. The kids will love their own space and the frog theme! 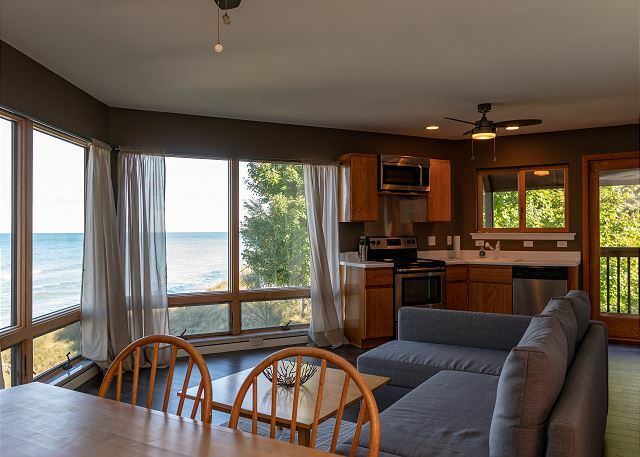 The open concept of the second floor includes dining seating for four, a Queen sized sofa sleeper, and fully stocked 2nd kitchen, all central to the beautiful views of Lake Michigan. 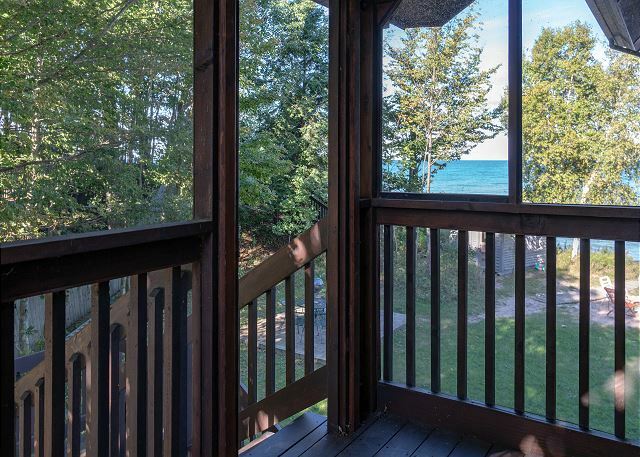 Enjoy the private balcony located off the kitchen of the second story. 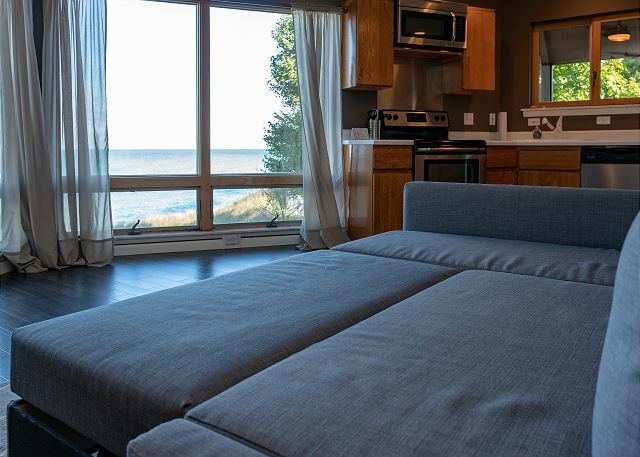 Accessible from the second story kitchen, the balcony is the perfect place to watch a sunrise with a cup of coffee. 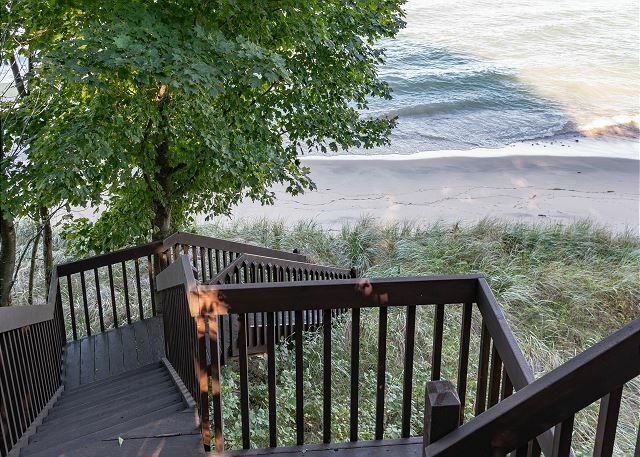 Use the stairwell off the 2nd story balcony as easy access to the beach or an alternative entrance to the second floor. The modern design of this 2nd floor living room sofa easily converts into an extra Full bed. Bedroom #4 is located on the 2nd floor and has a Queen bed. 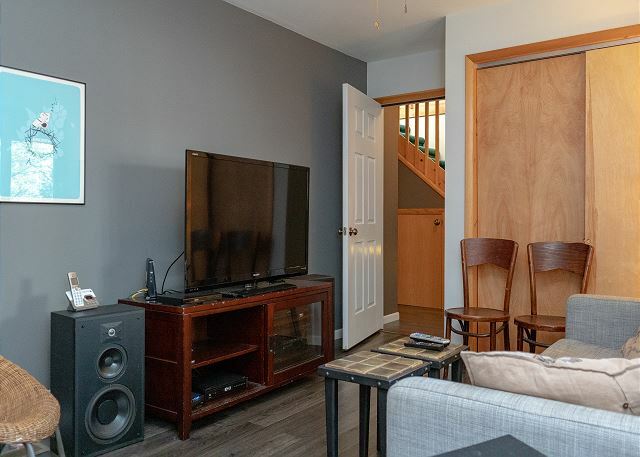 The third floor is set up like a studio apartment with an open concept. The 5th bedroom is located on the 3rd floor and includes a Queen bed and a Queen sofa sleeper. A second laundry facility is conveniently located on the 3rd floor. 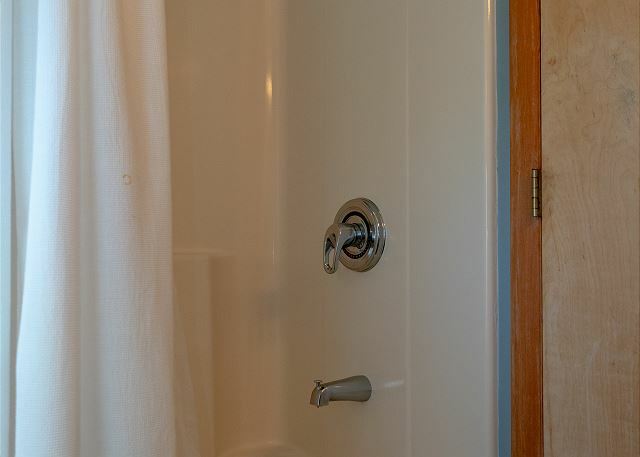 A full bath is located on the 3rd floor and includes a tub/shower combo. 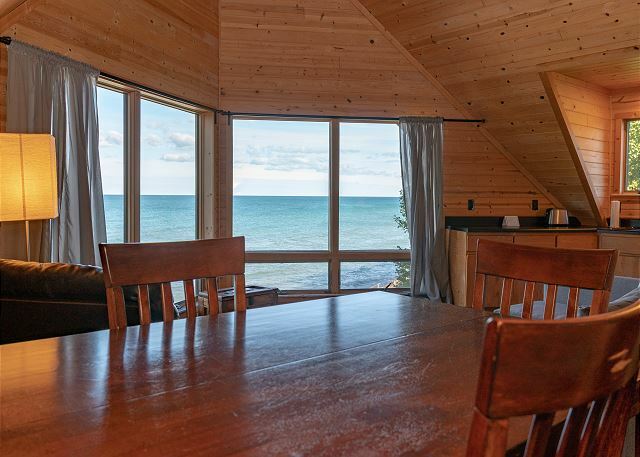 Dining seating for four and beautiful views of Lake Michigan. 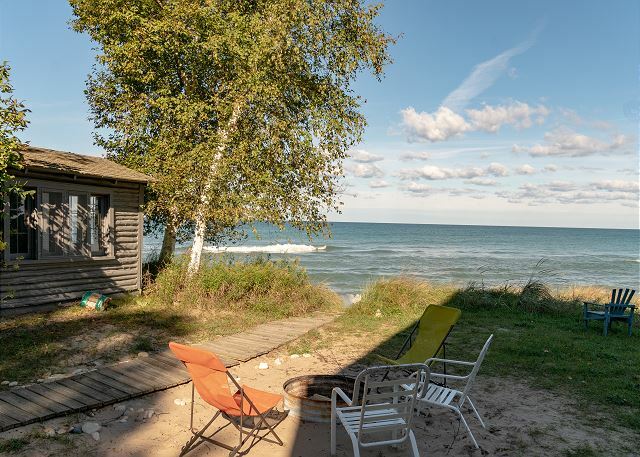 You will never get tired of waking up to beautiful Lake Michigan views. Couch by day, Full bed by night-easily converted into additional sleeping accommodations. 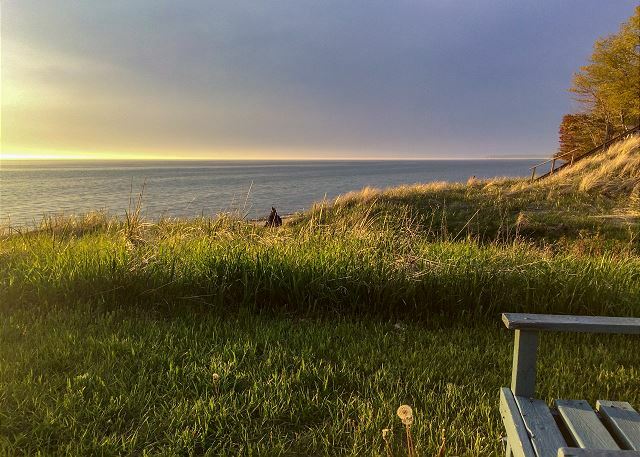 If you are looking for peace and quiet, this will be your place! 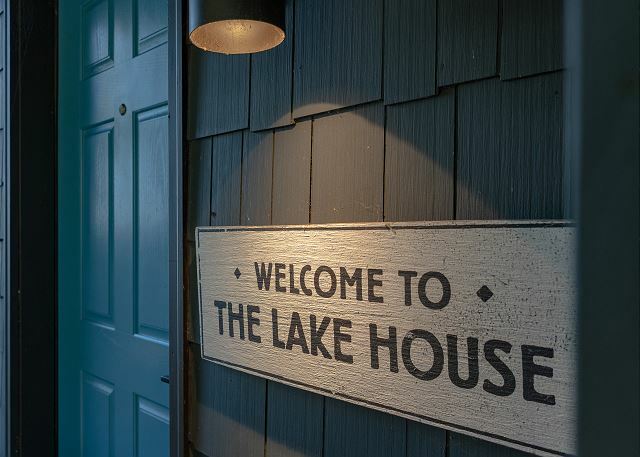 The original boat house is the perfect place to enjoy some solitude or even some lake-side yoga! 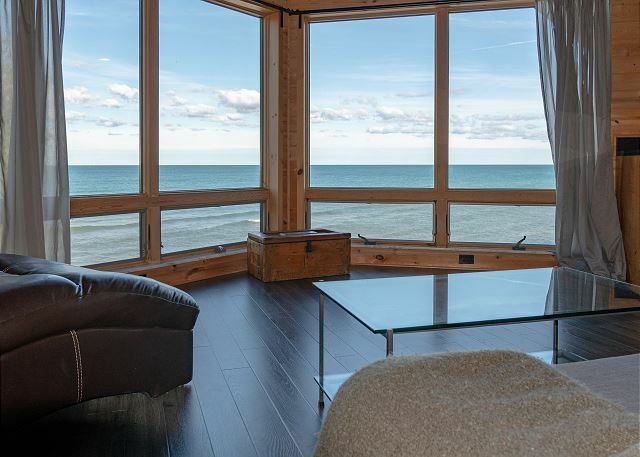 Open the windows and enjoy the breeze that will blow through while you enjoy some rest and relaxation out of the sun. After you finish taking in the breathtaking views, meander down to the beach and experience the sand between your toes. 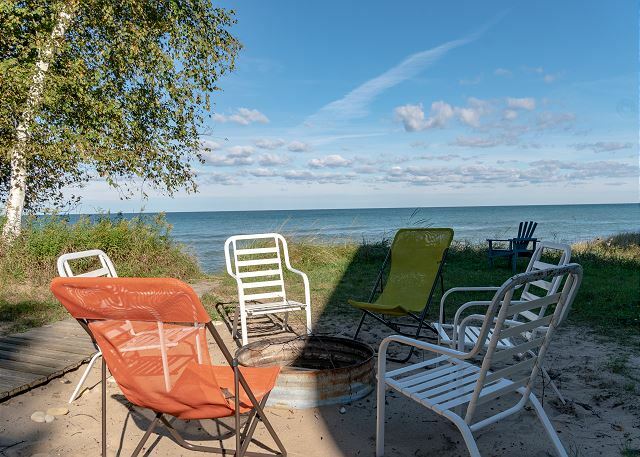 Enjoy a fire and some relaxation right outside your door! Use the charcoal grill provided to cook up a delicious dinner and enjoy it out on the patio. 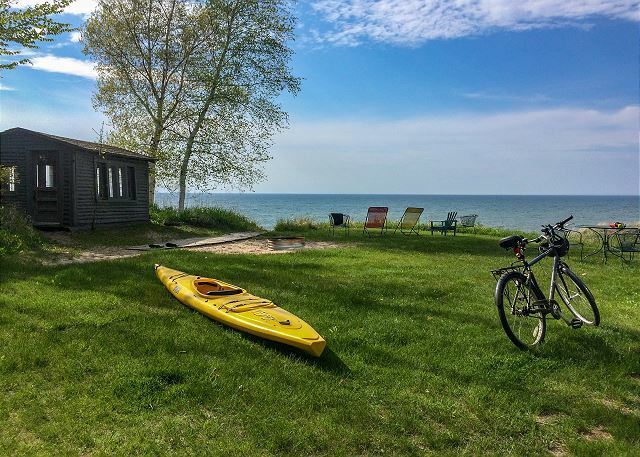 You will find so much to do to occupy your time while staying at Bellavita-you really won't want to leave! 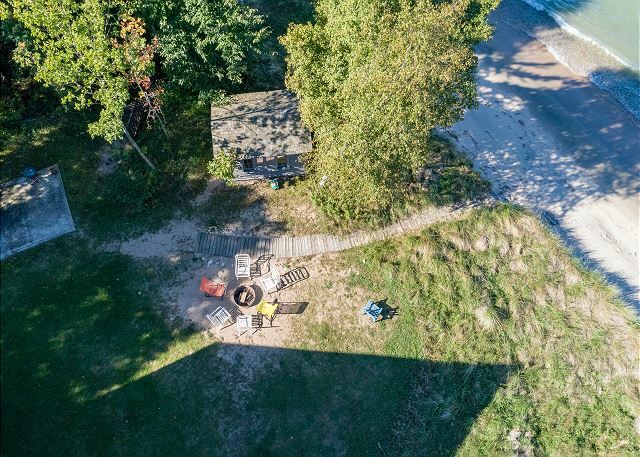 You are literally steps away from your own private beach. 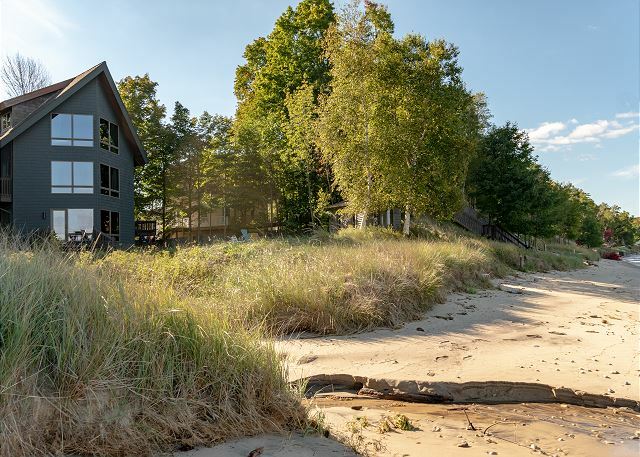 The location of Bellavita feels so vast and private and gives you the full experience of water, sand, grass, hills, and streams all in one place. 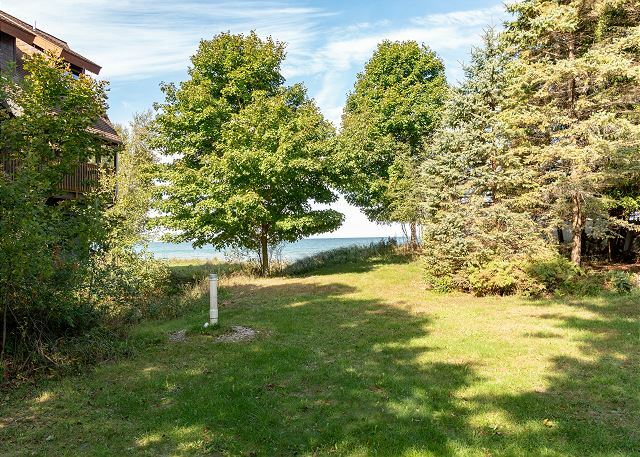 The neighboring vacant lot will give you plenty of room to park, play and explore. 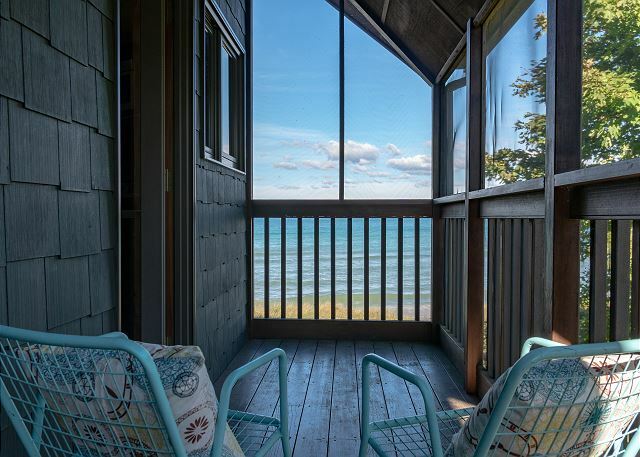 Spend your summer vacation in this one-of-a-kind, Lake Michigan cottage in Manistee. The home, being intentionally built as a generational home will give you the privacy and space you desire while being together as a family all under one roof. 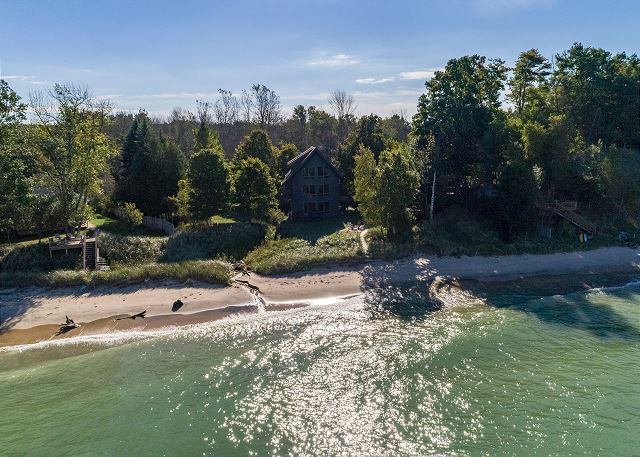 The home boasts 5 bedrooms, 5 bathrooms, and 3 kitchens. When you walk into the home, you will enter on the main floor, and into the dining room, kitchen, and living area. 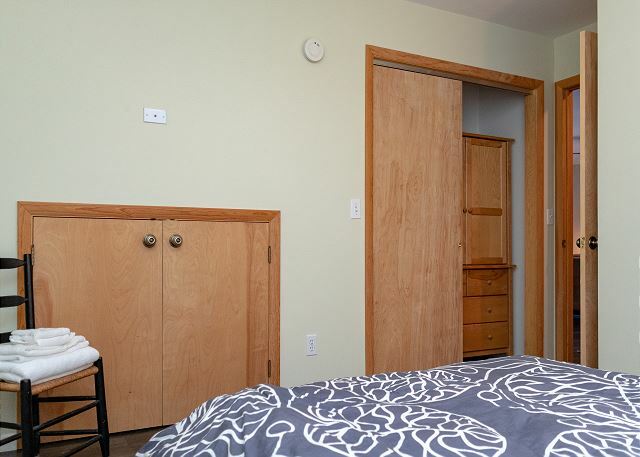 A Queen bedroom and full bathroom are located off the main living area. 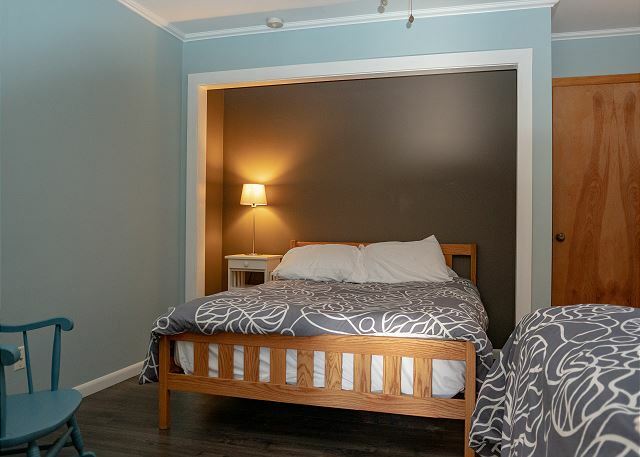 A sitting room, with television, games and books provides a walk-thru to the second bedroom, which includes both a Queen and Full bed with an adjoining bath and loft area. 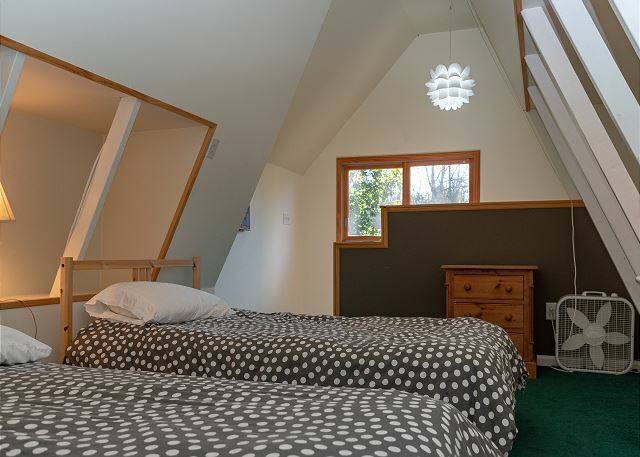 The loft features both a Full and Twin bed. 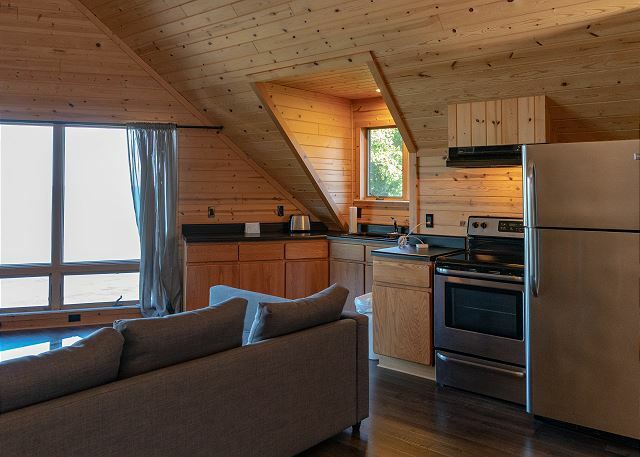 Floor two includes a second full kitchen, dining and living area with a pull-out Full sofa sleeper, and a private balcony accessible from both the kitchen and the outside. 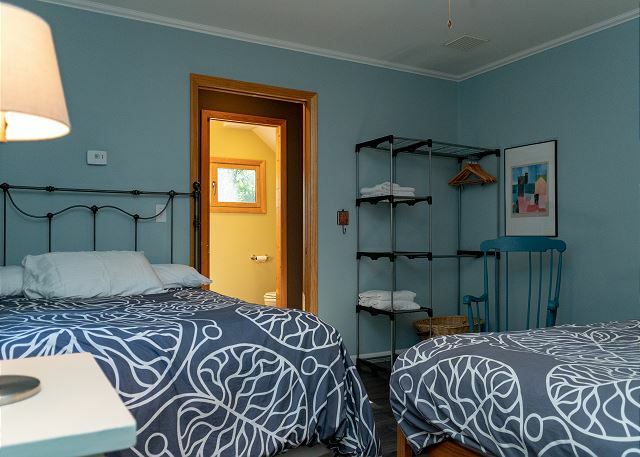 A bedroom with a Queen bed and two full bathrooms, one with separate shower room and laundry facilities makes it perfect for a second family. 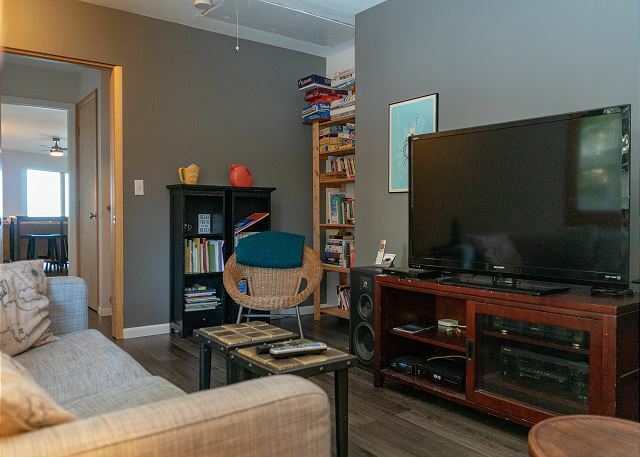 Floor three is set up as a studio apartment with a third kitchen, living area with Full pull-out sofa sleeper and full bath with shower/tub combo. A second laundry room is located on the 3rd floor. Additional amenities include: central air conditioning, secure wifi, and a pack & play. 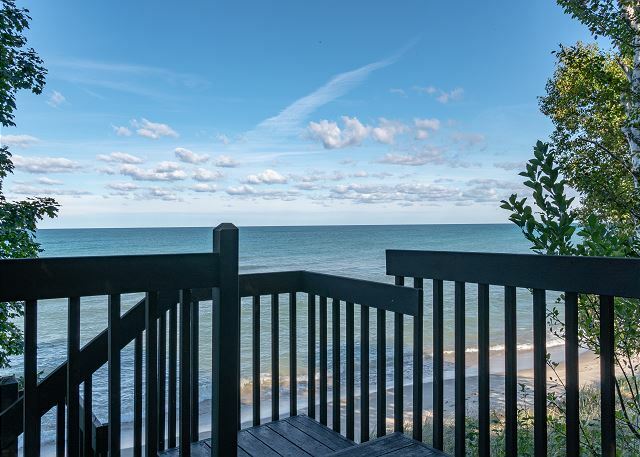 Enjoy the sunset from any of the amazing decks, including a completely separate wooden look-out over Lake Michigan. 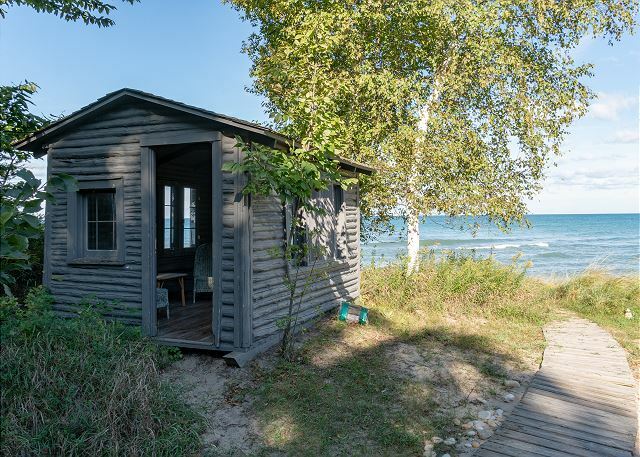 An original lake-side "boathouse" is the perfect place to enjoy a quiet morning by yourself or maybe even some yoga-open the windows and let the breeze blow through. 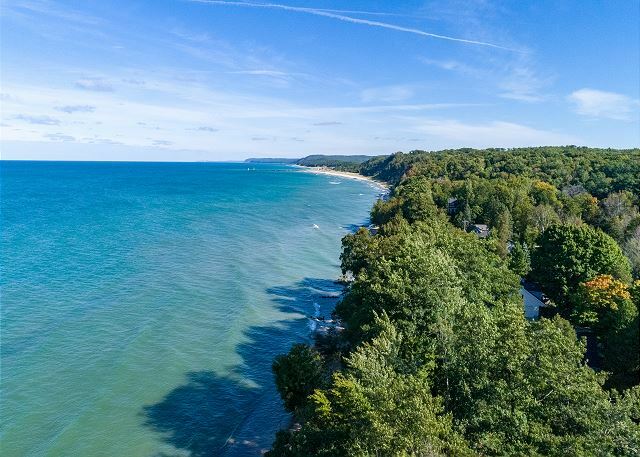 Spend the day building sand castles on the beach and splashing in Lake Michigan, or exploring the creek that runs alongside the home and into the lake. You will have plenty of place to park and play in the additional grassy lot to the right of the home. The home sleeps 17. All bed linens and bath linens are provided. The main dining area located on the first floor will seat 10 at two adjacent tables and an additional five at the center kitchen counter bar. 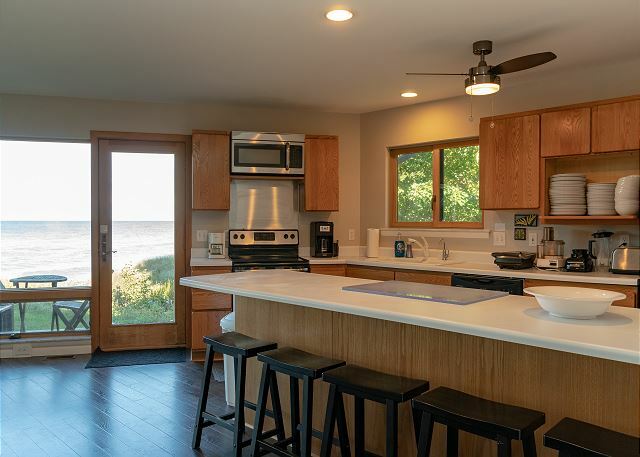 The main kitchen area is fully equipped with all cookware, dinnerware, utensils and lots of extras like a waffle maker, blender, toaster and food processor. A standard drip coffee pot is also conveniently located in each of the kitchens on every floor. 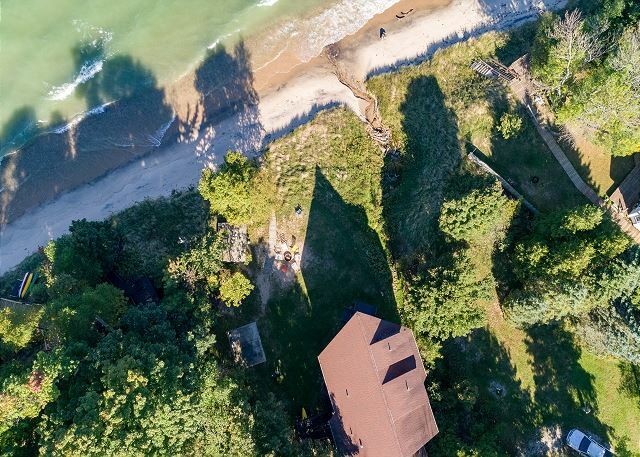 You will feel like you are away from it all on your own slice of Lake Michigan beach, but in reality you are only a ten minute drive to downtown Manistee. 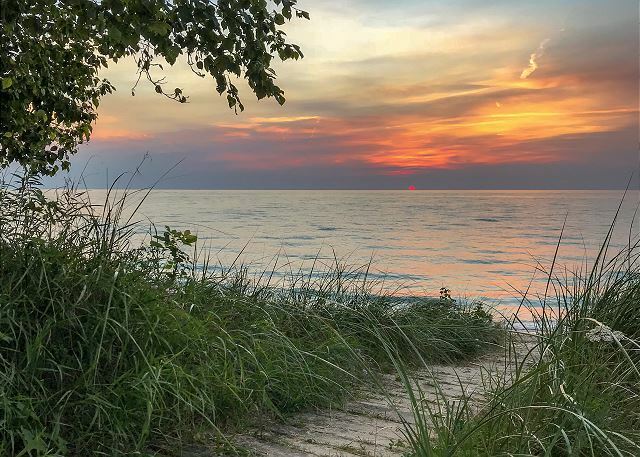 Manistee offers many restaurant options, breweries, shopping and a beautiful riverwalk along the Manistee River out to Lake Michigan. 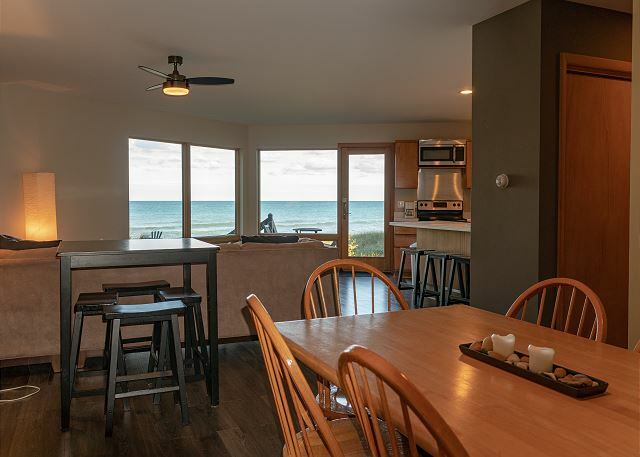 There's plenty to explore should you choose to leave the comforts of this beautiful home and the convenience of your very own beach. Enjoy your Unsalted Vacation-free of stress, free of salt!